When he’s not engaged in his role as managing director–private wealth advisor at UBS Financial Services Inc., Naples, Jason Stephens devotes his time and resources to a wide array of local organizations, from coaching baseball with the Greater Naples Little League and soccer in the Naples Optimist, to serving as a planned giving board member for the David Lawrence Center. Stephens, who came to Naples at the age of 8, graduated from the University of Florida, and started in the financial services industry. He briefly worked in the World Trade Center in New York. 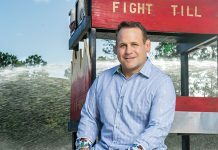 He returned to Naples to form a highly specialized investment team and has gained recognition for his business successes, along with being ranked one of the USTA’s top 4.0 men’s tennis players in the state. His hero: My grandfather, a survivor of one of WW II’s greatest tragedies, the sinking of the USS Indianapolis. He is one of 321 survivors out of 1,200 aboard. He spent five days in shark-infested waters in the Pacific Ocean before being rescued. Words to live by: “The world is a book and those who do not travel read only one page.” —St. Augustine. “Super” spots: Naples Botanical Garden, Tavern on the Bay at Bayfront Place, and Jimmy P’s Butcher Shop & Deli. Can’t live without: Family, Florida Gator football, and a great wine with dinner. Top of the bucket list: Bora Bora, an African safari, and a visit to Patagonia. Fun facts: I was a left-handed pitcher while playing college baseball; I love to cook; I have traveled to 41 countries and 46 states so far.